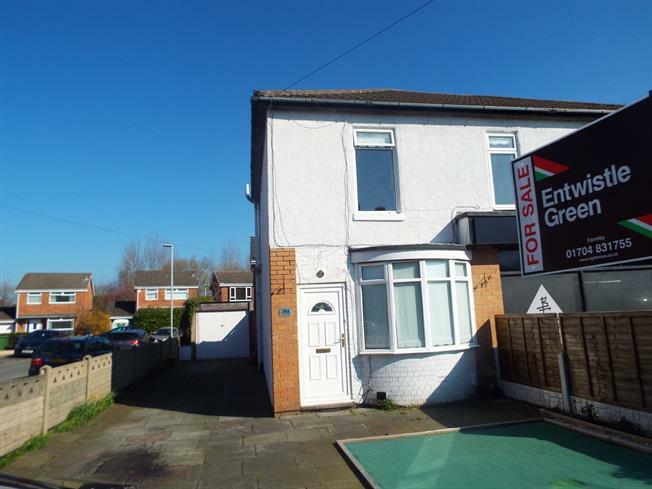 3 Bedroom Semi Detached House For Sale in Liverpool for Offers Over £220,000. This property's price has dropped from £230,000 to Offers Over £220,000. Entwistle Green are offering the opportunity to purchase this four bedroom family home. The property is ideally located within close proximity to the amenities and shops at Formby village. The property also has the opportunity for investors to extend, create separate flats and/or to create commercial premises. The property briefly comprises; entrance porch, lounge/dining room, kitchen, first floor landing, with three bedrooms, study/nursery and a family bathroom. Externally the property benefits from a driveway providing off road parking for three cars and a garage. To the rear of the property is an enclosed rear courtyard. Call our office today to arrange a viewing. Open plan lounge/dining room. Wood effect flooring. Radiator. Double glazed uPVC bay window. Fitted high gloss wall and base units with complementary work surfaces. Integrated oven, hob, extractor hood, fridge/freezer, plumbing and housing for washing machine. Door to garden. Storage space under-stairs. Stairs leading to first floor landing. Bright and spacious master bedroom, carpeted, with double glazed uPVC window. Radiator. Double bedroom, carpeted, with double glazed uPVC window to rear aspect. Radiator. Generous double bedroom, carpeted, with double glazed uPVC window. Radiator. Ideal as office/study space but with room to fit a single bed. Double glazed uPVC window. Radiator. Generous driveway to front providing off road parking for three cars. Garage with power and lighting. Rear enclosed courtyard with sunny aspect.